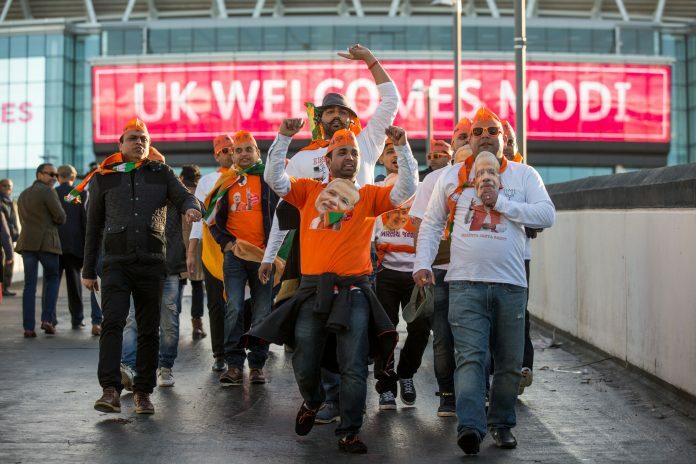 For the BJP, the diaspora is a resource to be used to strengthen Brand India. In contrast, the Congress limits itself to assuring them protection from ‘exploitation’. An important focus of Prime Minister Narendra Modi’s regime has been the extraordinary emphasis on connecting with the Indian Overseas community. While previous governments have also reached out to them, Modi has elevated it to a high priority in India’s foreign policy. Wowing the Americans with his rock star performance in the Madison Square Garden in New York, massive crowds cheering him in Wembley stadium in the U.K. and elsewhere- were all part of this strategy. He is clear that the diaspora can be leveraged to influence the host nations, and function as a lobby to project ‘Brand Modi” and India. Modi has so far made 60 foreign visits, covering five continents and addressed many meetings of diaspora . Why is Modi wooing the diaspora? First of all, the overseas community has become quite influential in many countries and occupies positions of political and economic importance. The latest initiative of the Modi government to mobilise their support was showcasing them in the first ever PIO Parliamentarian conference on Pravasi Diwas, in which as many as 124 parliamentarians and 17 mayors of Indian origin from 23 countries participated. “Whenever I travel, I like to meet people of Indian origin. I have met many of you like this. The reason is that you are permanent ambassadors of the country,” he told them. Calling the conference a mini world parliament, Modi observed, “Your achievements are a point of pride for us. Even when you are nominated for political office anywhere, we are very happy.” He noted that persons of Indian origin were today the Prime Ministers of Mauritius, Portugal and Ireland. The Prime Minister is perhaps emulating the powerful Chinese and Jewish lobbies to utilise the diaspora’s influence. The Indian overseas community is indeed the second biggest after China, with more than 30 million living in 205 countries around the world. The diaspora contributes not only to economic development, but also plays a significant role in supporting the country’s foreign policy. New Delhi is also regularly taking their help to counter negative publicity abroad. The remittances from diaspora are estimated at over $70 billion. In 2016-17, the FDI inflows stood at $60 billion, the highest ever recorded for a fiscal year. Secondly, being a Gujarati, Modi is fully making use of the Gujarati pride of the people of his home state, who have spread out all over the world and remain rich and influential. They have a natural affinity and pride that one of them has now become the Prime Minister. Several NRI volunteers had come to India to help Modi before the 2014 Lok Sabha polls with their money and support. Thirdly, while Nehru held that overseas Indians should adapt themselves to their adopted country, a policy was also followed by his daughter Indira Gandhi, it was her son Rajiv Gandhi, who recognised their potential in promoting India’s foreign policy objectives. But it was only after the economic liberalisation of the 1990s that the diaspora consolidation picked up. The Narasimha Rao government also saw their potential, but it was during Vajpayee’s time from 1998-2004 that it became a powerful lobby. Prime Minister Manmohan Singh used the NRI lobby for his pet Indo-US nuclear deal. Modi has taken it much higher. In contrast, the Congress manifesto limited itself to the protection of the ‘Indians overseas from exploitation’. Its relationship with the Indian National Overseas Congress in the US is dormant. Only now has Congress President Rahul Gandhi started wooing the diaspora. Over the years, successive governments have met the diaspora’s demands, including providing the PIO and OCI cards. Their two important demands were dual citizenship and voting rights. Modi has taken it further by relaxing visa norms, ease-of-doing-business and merging the OCI and PIO cards. A bill has been introduced last month in Parliament to provide proxy-voting rights to NRIs. It is indeed two-way traffic. The diaspora also expects India to stand by them in their hour of need. The government had evacuated Indian citizens trapped in the civil wars of Iraq and Libya in 2014. India was the first to respond during an earthquake in Nepal, floods in Sri Lanka, and water problems in the Maldives. New Delhi also gets involved in other issues like ill treatment, denial of rights, loss of property, hijacks, natural disasters and military conflicts. In short, Modi’s diaspora policy has helped him build his image abroad. His proactive outreach has indeed reached heights not seen before. While the diaspora may be small in number, they have the money power and political influence to support Modi. How far this will help in 2019 Lok Sabha polls is to be seen.